Astrology overlapped into the occult and alchemy, with variations such as geomancy, which was a kind of short-hand, low-tech astrology. It was done by drawing a series of dots on the earth or parchment and then applying complex astrological calculations to them in order to make predictions. Nonetheless, kings and other men in charge paid geomancers for their advice. 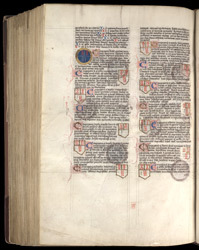 This mauscript includes a treatise on geomancy by Alpharino and translated into Latin by Platon. The diagrams here relate in some way to the patterns of dots.